You have probably come across an EPC if you have bought, sold or rented a home or business premises in the last 10 years, but do you know why they are used? EPC stands for Energy Performance Certificate which is a certificate that gives information about the energy efficiency of a building. It also indicates what energy efficiency level could be achieved in that property through carrying out some of the suggested energy efficiency measures. Suggestions include upgrading the boiler, wall and roof insulation, and draft proofing. The EPC also gives an indication of how much energy that property typically uses. 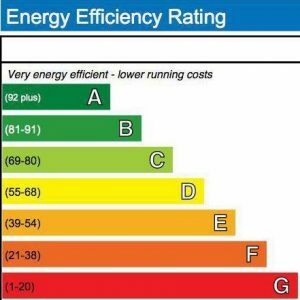 The EPC uses an A-G rating like the energy efficiency rating used for an appliance. These rating scales are deliberately similar so that people can become familiar with the rating scale. EPCs are used for both domestic and commercial properties. What Does the EPC Show? EPCs are required whenever a home or premise is sold or rented. The EPC must be disclosed in the marketing materials for the property and so needs to be completed before the property is advertised. In addition, in Scotland, the EPC must be displayed in the property such as next to the boiler or in the meter cupboard. An EPC can only be completed by an accredited Domestic Energy Assessor (DEA) or Commercial Energy Assessor if it is for a commercial property. If you are selling or renting your home, then your estate agent may include the EPC as part of their package or they will suggest an assessor to use. You can find a Domestic Energy Assessor on the EPC Register website or a Commercial Energy Assessor through the Non-Domestic EPC Register website. How Long Are EPCs Valid For? EPCs are valid for 10 years if the property has not been significantly altered, a new boiler or insulation has been installed. You can check if there is a valid EPC for your home on the EPC Register. Once You Have an EPC What Do You Do with It? In domestic properties, it only needs to be used when selling or renting the property unless you are in Scotland where it should be displayed near the boiler or energy meter. The government introduced EPCs as a method of rating the UK’s homes and properties in a clear manner that could be easily understood and help people to make decisions on selecting a home based on how much the property will cost to run. It was also introduced to help encourage homeowners, landlords, and businesses to invest in energy efficiency measures and to clearly see what savings these measures could make to their property. There are several occasions where the EPC rating may now impact your home and what you can do with it. If you are a landlord there is a minimum EPC rating of E for properties rented out after the 1 April 2018 and for any tenancy renewals. All existing tenancies will need to meet an EPC E rating by 1 April 2020. You will need to meet a minimum EPC level if you want to install renewable energy technologies in your home, such as solar PV, solar thermal, biomass, or heat pumps, and you want to benefit from the government’s incentive schemes, Feed-in Tariff (FIT) or Renewable Heat Incentive (RHI). Depending on the incentive and the technology being installed to what EPC rating level you will need. The FIT offers different rates depending on what your EPC rating is. So, it is worth investing in home insulation before installing renewable energy systems to not only benefit from the incentives but to also reduce your energy bills and heating needs.